I discovered some great slide show templates in Photobucket. 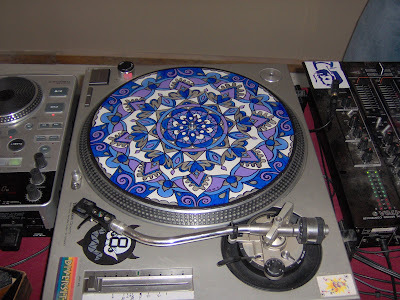 Is this one not just absolutely perfect for my Mandala Records? A couple of years ago I hung some of my work and led a mandala workshop for the Sustainable Community Convergence. They had a d.j. 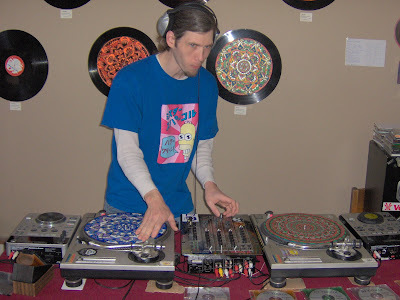 there who had a little fun spinning my records too. Trillium Artisans and PDX Etsy in the Storque! I wrote this article for the Storque, Etsy's new online magazine and blog. 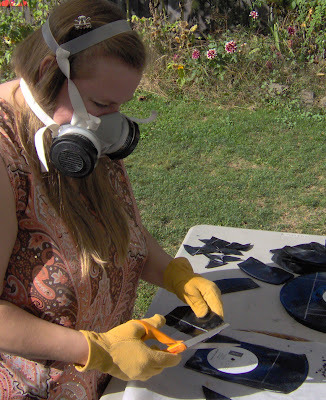 In case you didn't know, I am employed as the Program Coordinator for Trillium Artisans, a nonprofit organization that supports Portland crafters who use recycled and reclaimed materials. I am also one of the artisan members. This Wednesday night is our monthly artisan meeting, and for our guest speaker we are having Ryan from Littleput Books, who will be sharing her tips and secrets for "How to Promote Yourself on Etsy." Ryan will be teaching this same class at the Etsy Labs next month, so we are super lucky to get a sneak preview! I had a lot of fun choosing "related items" for the article. I tried to include items from Trillium's Etsy shop as well as items from various Trillium members who are Etsy sellers, and items from PDX Etsy members who are attending the workshop. This project is funded by a grant from the Oregon Arts Commission and the National Endowment for the Arts. This weekend I am cutting records. Makes me sound like a rock star, I know! Well, the band still hasn't made it into the studio, but I have a lot of Roman Record Cuffs to make for the holiday season, so I am working on slicing up some of the 6 cases of warped rap records I saved from the landfill about a year ago. So, do you want to know my secrets? Do you have any idea how long it took me to learn how to do this? Well, here it is: you gotta heat it up first. That's about it. 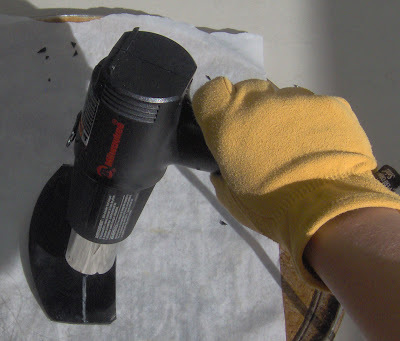 I used to use the oven but now I have a HEAT GUN! Blast it with some hot, hot heat and you can just cut it with regular scissors. So now you know! Have fun. Be safe. 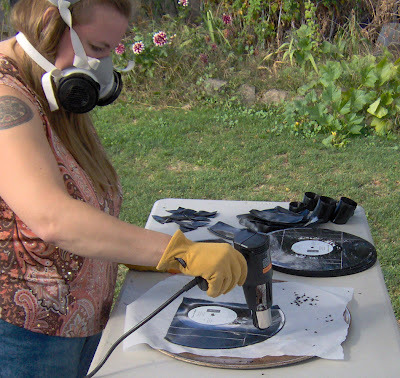 Wear protective gloves and a respirator. And if you can't manage to make your own cuff, just buy one from me! 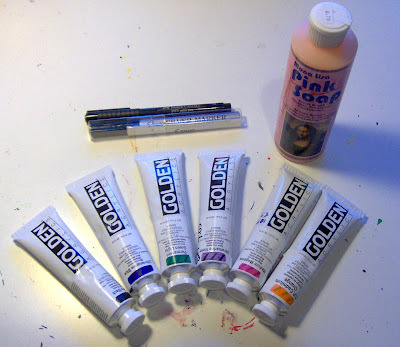 There is nothing quite so fabulous as the feeling I get when purchasing high quality, expensive new art supplies. Yesterday after picking Julius up from school, we headed into Portland's absolute BEST art supply store, I've Been Framed, so I could finally use the gift certificate that the Duniway art committee gave me last year. I picked up a rainbow of the best, juiciest, most excellent Golden brand acrylics, a cool silver marker, and one of my favorite "F" style black artist pens by Faber-Castell. I also got some Pink Soap, which is simply awesome for cleaning and conditioning paint brushes. While browsing, I ran into the amazing artist Alison O'Donoghue, who is also a former Duniway art committee member. I really love Alison's work. The best part - I only used about half of my gift certificate, so I'll be going back to shop more soon! I'm still a little overwhelmed from all the excitement of yesterday's HGTV show, so I thought I would just post these two beautiful treasuries that indiaylaluna and unstrungsisters were kind enough to include my work in. Many thanks to all of the wonderful, supportive Etsy people who commented on my show. It was so great to hear from all of you, thank you! This is what one of my murals looked like when it was illuminated by a big fancy light for our HGTV shoot two years ago. Finally, TONIGHT, I will get to watch the show! Please tune in to HGTV's "Look What I Did" tonight (Sept. 19) at 5:00 pm ET/PT. This is a show about "homeowners who break the design mold." My segment is all about my master bedroom which is also my studio and home office. 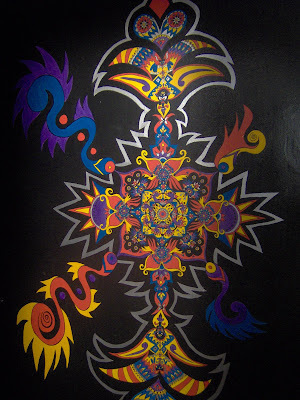 The walls and ceiling are all adorned with my original painted mandala designs. You can see more pictures on my website. 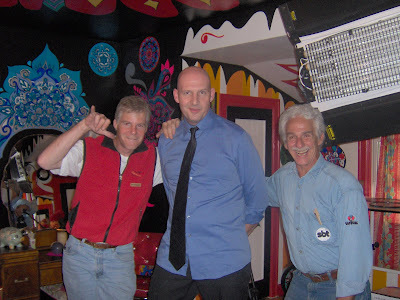 Here's Chuck posing with a couple of the guys from the crew - the lighting guy and the "grip." They made my husband wear a tie to help counteract all his tattoos. I don't think the collar fully covered up the one around his neck, but we'll see. 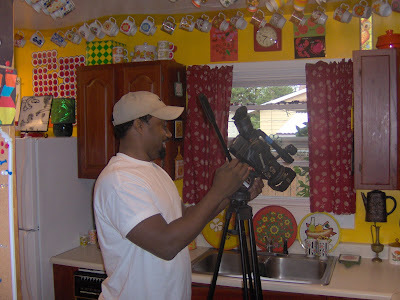 Above is our director, Renato, getting the camera set up in order to interview me in the kitchen. Renato was also the director for my "That's Clever!" shoot, which will air on HGTV some time this holiday season. My Roman Record Cuffs are now available at Tender Loving Empire, a really cool little gallery in the Pearl District. Are you in Portland? Visit them at NW 18th and Lovejoy. They carry work from a lot of awesome Etsy sellers. Brianne, one of the owners (and a real sweetheart! ), told me "I'm on Etsy right now," pointing to her computer screen, while she was checking in my inventory. I'm kind of stoked because apparently they don't actually carry that much work from local people, but they like my cuffs! My cuffs will be available at Tender Loving Empire through the end of the year (and hopefully longer! ), so look for them if you plan to do any holiday shopping in the Pearl. Even though my kids have graduated from Duniway Elementary School, I am pleased to announce that I have been hired by Duniway's after school program to lead a group of students in creating a mandala mural this fall. I pitched my idea to the staff last week and was just given the green light. The above picture is from a project I did with Tangereen's Campfire troupe when she was in fourth grade, for the Duniway Foundation Auction. I'm really looking forward to creating a large scale mandala to permanently adorn one of the best elementary schools in Portland. I will post photos of the project here as it progresses. 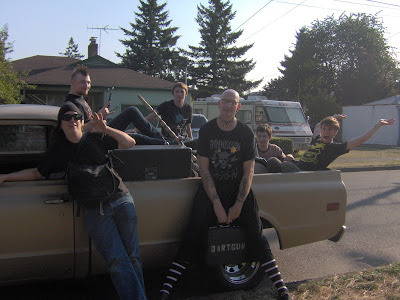 Here are some of the guys (rockers and roadies) pulling up with the equipment after the show. 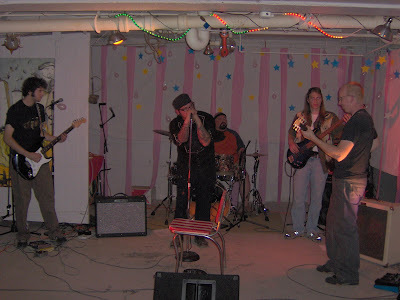 We played yesterday at the Foster Art Walk - as Chuck said, it was "Dartgun's first ever show during daylight hours (Lestat, are you listening?)." The kid with the mohawk is Andrew, it was his 20th birthday. Happy birthday, Andrew! There are no pictures of our performance but I did get this shot of Hello Cleveland: These guys rocked. Their singer is Chris, who did an excellent job of organizing this event. The space, down in the basement warehouse at Bear eCycling at 63rd and Foster, was so cool. They called it the "Bear Bunker" and it was filled with art and madness, including a mind-blowing installation by Joseph Demaree. Check out this artist, he is really amazing. So, I had all these ugly marks on my bathroom wall where the paint was kind of chipped off. 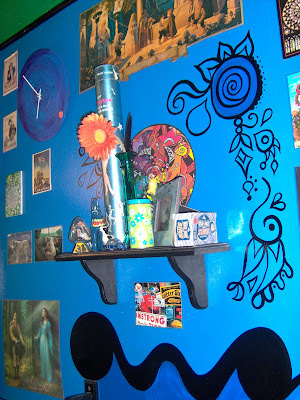 I filled the holes in with spackling compound, primed over them, and then when I was ready to touch it up, I discovered that the blue paint I had was actually a darker shade of blue (which I got for my living room), not the same color as the bathroom wall. 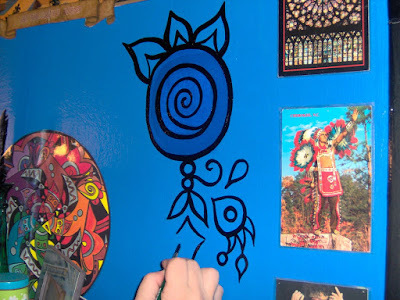 Well, of course I went ahead and painted over the spots with the darker blue and then had myself a ball embellishing them with doodled designs in black acrylic. 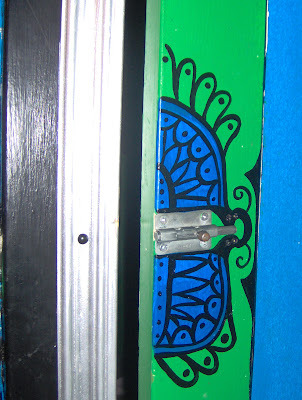 There were a lot of scratches around the edge of the door, so this became some sort of psychedelic moth. The big fish is made out of a record that broke when I dropped it on the hardwood floor. The two pieces that broke off became a perfect tail, and the opening left by the broken-out pieces made a perfect mouth. 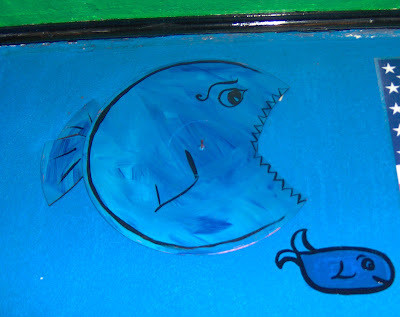 So I made it into a fish, but there was a hole in the wall below it so I made that into a cute little fishy. Oh yeah, my bathroom rocks! Along with some of my fellow members of Trillium Artisans and PDX Etsy, I will be setting up my booth at the Lents Crossroads Plaza at SE 92nd and Foster this Saturday for the Foster Street Fair and Art Walk. This should be a pretty cool event, and there is even going to be a trolley to ferry people up and down the street. Come check it out! 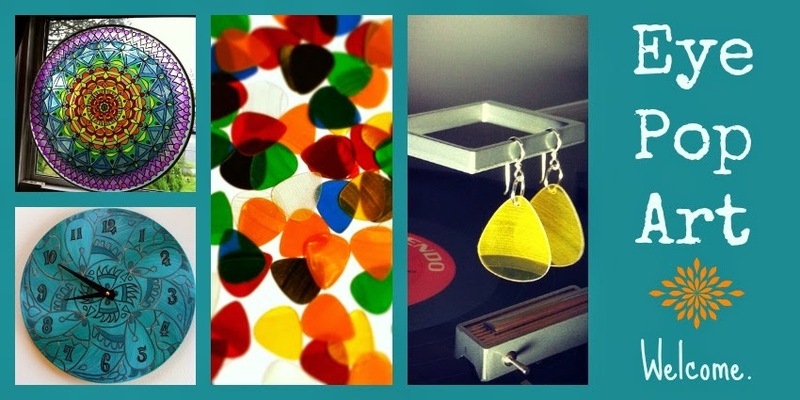 All over SE Foster Road in Portland - we'll be at the corner of 92nd and Foster by the Trillium Artisans gallery. 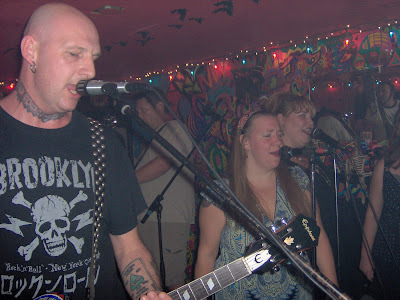 AND - at 3:00 pm on Saturday, smack dab in the middle of the Foster Art Walk, Dartgun (with the Vignettes) will be performing as part of the festivities! We'll be playing in a warehouse space on SE 63rd just south of Foster Road. Kill two birds with one stone - come to both of my shows in one day! Here's another treasury featuring my new Portland Record Cuff! I love this treasury! I can't believe I found myself in five different treasuries all in one day this week. Insane! I love how you can find the coolest socks now. Tangereen wore these for her first day of 8th grade. I was amazed to find that one of my cuffs "hit popular" on Stylehive yesterday. Wow! Lots of people seem to like it. I really like this one because it is kind of asymmetrical. 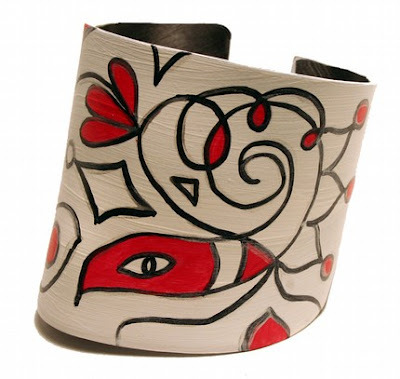 Click here to check out this cuff, called "Red Beak," at my Etsy shop. I took the above picture at the Museum of Modern Art in New York, because I am kind of silly about records. I am surprised that I didn't get killed for using the flash. So, I have been tagged, and I need to find a way to intersperse seven weird things about me into this post. I'll challenge myself and try to tie each fact in with a picture from the trip I took to New York in May. I'll do my best. Thanks, Alice! I snapped this picture from the window while riding through Manhattan in Joan's taxi. I LOVE to play chess. I am the holder of a trophy that I won from my husband after winning 100 games against him. I'm really not that good but I do love playing. Here I am, looking like a dork, playing chess at Washington Square Park with some of the hustlers who were actually in the movie Searching for Bobby Fischer: Yes, of course, I lost, but it was 5 bucks well spent. Well, here's another picture (no flash this time!) that I took at the MoMA. I am showing you this because you might think it's weird that my son's middle name is Elvis. In truth, he has two middle names. His name is Julius Elvis Chaos Claringbold. Anyway, I love Vonnegut and I will never forget the time I got his autograph when he visited Powell's in 1992. Fact #6 : I'm a friend of a friend of this person! While we were at Coney Island, Joan pointed out this big painting and told me about how she was once roommates with Heather Holliday, World's Youngest Female Sword Swallower. Everything was closed down for the season, so unfortunately we didn't get to check out any of the freaks. This excellent piece was executed by none other than Julius Elvis Chaos, when he was in first grade. He chose it to hang in the school art show, and when asked to come up with a title for it, he decided to call it "Eye Pop." When I was trying to think of a name for my business, I kept going back to the phrase, "Eye Candy," which is how I have heard a lot of my friends describe my work. But that just didn't quite seem right. Then it dawned on me: why not Eye Pop? It was fun to pay a little homage to one of my favorite artists (Julius), and also a good play on words. You say, "So do I!" So there you have it, seven facts about me, and many bonus New York photos too! And would you believe it, I just checked back and saw that I was only required to list 6 things, not 7! So I overdid it. Oh well, nothing unusual there.